If you have ever spent time researching reduced cost or free prescription drugs on the web, you've also found information about discount prescription drug cards. With an original intent of helping patients obtain their prescription drugs more affordably, these cards have become a great help to some, while others have realized there is a little discount to be had, and even others have been scammed. Discount cards that help you pay for your prescription drugs are not part of your insurance. They help you either instead of insurance or in addition to health insurance. Understanding how these cards work, and whether they can truly be helpful to you, is important. Everyone can use a drug discount card, but not everyone should, nor can everyone save money using one. How useful a discount drug card can be to you depends on the card, its cost, and the rules for using it. Like Prescription Assistance Plans, some cards have eligibility restrictions. These restrictions may be income limits, age limits (usually over 65, or families with young children). These types of cards are usually free or their fees are very low. They are typically offered by the government, such as Medicare prescription discount cards. Membership organizations sometimes offer cards to their members, meaning you need to be a member to obtain one. These cards won't provide free prescription drugs, but they will offer discounts. For example, AARP and FamilyWize, which is part of the United Way, are two groups that do this. Some cards are available to anyone. They require that you pay for the use of the card, and that may be an annual or monthly recurring fee. When they are restriction-free, they are more expensive, but may still result in lower purchase prices for the drugs. They are usually offered by a company that negotiates with individual pharmacies for lower pricing. Store affinity cards are available to anyone who meets a store's criteria. These are most often offered by drug stores and discount department stores for drugs purchased in their own pharmacies. Sam's Club and Kmart are among the stores that offer these kinds of cards. Some cards are offered by drug manufacturers to people who are not covered by prescription plans through their health insurance. For example, Merck and Pfizer offer cards, and a group of 10 pharmaceutical companies together offer a card called the Together Rx Access Card. Some drug discount cards are scams—intending only to take your fee, and not truly provide you with discounts that are not available elsewhere. That is why it's so important that you review each possible card carefully to determine what your specific discounts, for your specific drugs, will be. How much does it cost you to obtain the card? Some are free, but not all of them are. What are the fees, or what is the purchase price? If there are fees, are they one-time only? Or do they recur? Is the card honored at your pharmacy? If the card is not honored at your pharmacy of choice, are you willing to change pharmacies to be able to use their discount? If the drugs you need are available only through a mail-order pharmacy, do you have to pay additional shipping and handling costs? Does the card cover the drugs you take? Not every card will help pay for every drug. The more common the drug you take, the better chance you can get a discount. Some cards cover generic drugs and some do not. Have you compared the cost of your drug through your pharmacy with other pharmacies in your area, too? Can you get a lower price using this drug card than any other price you've found, even when you take into account the cost of obtaining the card, or shipping costs (if applicable)? Once you have made the assessment for each card you are eligible for, you'll be able to determine your best option for saving money. Needy Meds maintains a master list of discount drug cards that are intended for people who meet income requirements. Several websites offer access to free drug discount cards, based on your eligibility. Find them at PatientAssistance.com, TogetherRX, RxAssist, or Medication Discount Card.com. Check with your local pharmacy or discount department store to see if they offer discount cards. Target, Kmart, Costco, Sam's Club, Walmart and many others offer discounts, some which have eligibility requirements. Not all discounts are offered in all their stores. Check with organizations you are a member of—you may be surprised at where cards can be obtained and how much money you can (or can't) save. For example, the American Association of Retired People (AARP) offers cards as does the American Automobile Association (AAA). A general search engine search will pull up names of many of the cards that are available to anyone to purchase. Please do your homework to make sure that if you pay for the use of the card, you will truly get a benefit from it. Many websites claim they will provide you with discounts. But after you've paid them a hefty fee, you'll learn that there is no benefit, or not enough to compensate for the fee. Many people can save money when we purchase our prescription drugs even if they don't have insurance. 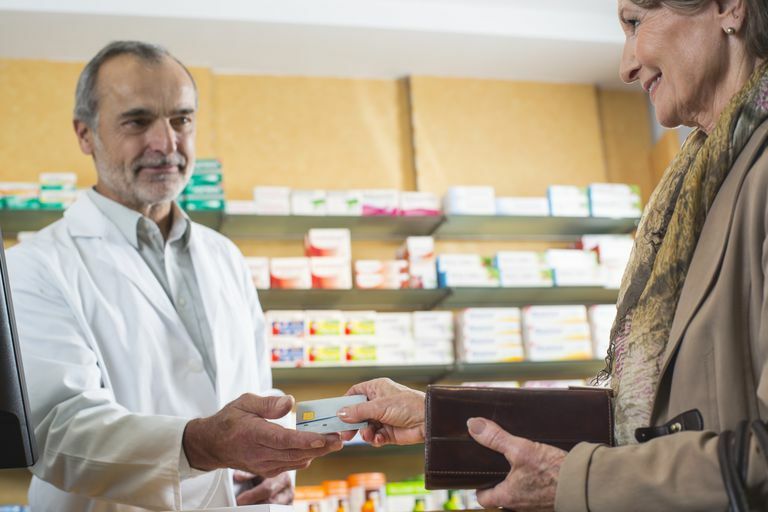 Understanding how prescription drug discounts work and whether you are eligible may reduce our cost for your prescriptions, but be smart and thorough in your research and use of your card. You want it to help and not hurt your pocketbook.